Finally you can eat delicious desserts without remorse! We have prepared for you a very healthy and quick recipe, low in calories and sugar and 100% gluten-free. Is there anyone who doesn’t like ice cream? We don’t think so, but what about those who are avoiding ice cream for it’s calories and sugar. So, if you started your diet or regimen of healthy eating and you miss something sweet to eat, do not be upset, this version of dessert is ideal for you, and for everyone else also. Instead of high calories desserts, high in sugar, we bring you one healthy and very simple recipe, recipe for frozen fruit yogurt, lower in calories than ice cream, which is ideal replacement. Preparation for this dessert is very simple, all you need is a blender and only four ingredients. 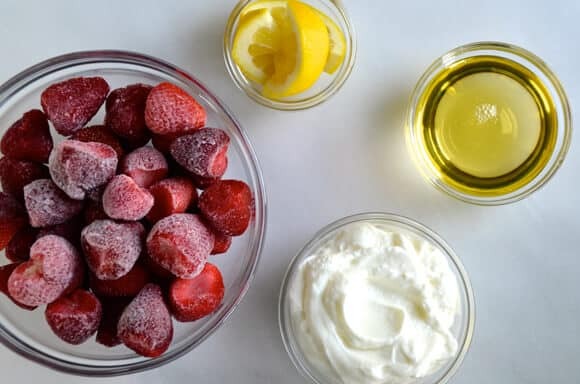 Like we mentioned already, this dessert recipe is very easy and simply to make, first, take out frozen fruit from fridge, put on side and let it stand for 5-6 min, to slightly dissolved, just until you prepare other ingredients. Then, put everything in a blender, frozen fruit, together with yogurt, honey and juice from already squeezed lemon and blend them well. Adjust sweetness and acidity by wish, depending on the amount of fructose on the main ingredient. If you are using extremely sweet fruit increase the amount of lemon juice and reduce the amount of honey for example or opposite. Blended mixture but in a bowl and add small amount of finely chopped fruit and stir well. Put the mixture in the freezer for at least half and after your dessert is ready to be served. For the ones who doesn’t count the calories, you can add chopped nuts or chocolate also.